Getting connected to the internet while on the road has become a necessity for many. It's an easy way to keep in touch with family through email or chat. You may also want to send home some pictures or work on a web page like this one. 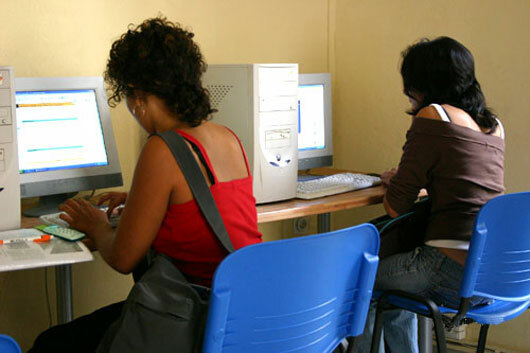 If you are a study abroad student chances are your program has a computer lab for you to use. You'll find more than often that the hours of use do not always match your needs. Thankfully the digital age is in Spain, and it is booming. Spaniards are adopting broadband and internet cafes are also very common, although the quality of connection and equipment varies greatly. There are some cyber cafes listed below and all were open as of February 2008. More will be added with additional information as I visit each place. Still looking for more free WiFi access points and will let you know when I find them. If you have one to suggest, please let me know the details (Name and address are the basics, any descriptions, etc. would be helpful!). For those of you with limited traveling experience, at least outside your own country, all the letters and symbols are not in the same place! Like the shift function on U.S. (English) keyboards, you'll at least need to master the art of Ctrl-Alt to access the third character on the key (keep this in mind when looking for the @ key). Other letters or characters are simply in different places. As PC users have been forced (in most cases) to adopt Windows Vista, there have been some problems connecting to certain WiFi connections in hotels and cyber cafes. Some of the older routers are not always compatible with Vista machines. I know from experience: in our office not matter what I did I could not get one laptop to connect to the WiFi. No until I changed to a new router/modem did it work. And the same experience at home until I change my router. Feel free to email me and tell me what I did wrong, but I spent over 12 cumulative hours and tried every trick in the book. In some cases downloading and installing the latest driver for your WiFi hardware will do the trick. As I have traveled over the last year this seems to be less of a problem, but it has popped up from time to time. Most cafes do a poor job promoting themselves online, and many online lists of cyber cafes do a worse job of keeping up to date on closings (and openings) of internet cafes in Granada. Many do seek out tourists although it is surprisingly hard to find web sites for individual cafes. Below is a list of internet cafes up and running. I will be back with a report soon. As for WiFi in cyber cafes, bars or coffee houses please let me know of any locations! I would like to build a list. then come back to this site and email me once you find a place! I know, I hate to leave a link to a section like this and then tell you I don't know anything. But I am hoping some of you might pass along some information to help everyone else out! Equipment: You can use the same equipment from the states so the modem you have in your laptop or desktop and the phone cord will work with the phone system in Spain. Cost of call: Depending on the telephone number offered the cost of the call can be relatively cheap or more expensive. Some of the major providers through Wanadoo, Terra, etc. have very good rates for dialing their local number. If you are staying in a hostal or apartment make sure you have a phone line and verify the cost of a local call. Some hotels may charge you between 0,75€ - 1,50€ per local call, making this a poor choice for internet access when traveling. National number: Check to see if they offer one national number or one telephone number which works in all of Spain for dial up access which is charged at a local rate. This can be helpful rather than hunting down the local number for your area every time you are on the road. Customer service: Be prepared for minimal customer service - some have even discontinued their telephone customer service, making it difficult to fix the problem if you don't have a connection. Email: Check to see if they offer a POP email account or only web based if you want to be able to check your email using Outlook Express or another client. Web space: If you want web space consider the space - some offer up to 50MB, while I've found that 10MB is more standard. Below are some providers for free dial-up (except what you pay Telefonica) and some of what they offer. In most cases I've pointed you to the section with information on the service. Always read the fine print! Zork.com - national, uses an ad supported model (ads appear in your browser, email, etc - much like Netzero did). One dial-up number for Spain like Gonuts4free, plus email and web space. Tiscali.es - national, 4 email accounts, 10MB web space, get your email by phone, receive faxes on your PC, and some multimedia applications. Oriolnet.com - national, 1 email account, one dial-up number for all of Spain (with local call rate) and one annoying flash intro when you go to their home page. Ya.com Jazzfree - national, 1 email account, 30MB web space, very cheap local call rates and 24 hour technical support! Wanadoo's Eresmas.com - national, cheap local dial up rates, pop-up blocker, an Accelerator app for faster connection but increases your dial up costs just a hair (um, ok), 1 email account, 50MB web space and tech support. Atodevela.com - Asturias only, with 2 email accounts, 10MB web space and some other utilities such as anti virus, ftp, irc and more. Whether you're here for a short time or an extended stay knowing the tools you can use online to manage your life makes things a lot easier. Below are some recommended links with a few descriptions. This is an option which may work for some, although I would recommend using a cyber cafe over trying to connect through your existing ISP. Working out the logistics, signing up to be eligible to use your ISP's plan and a whole host of other issues make this a less than preferred method in my book. If you have AOL check out their international access plan for more information. Earthlink offers a WiFi plan through Boingo which may get you connected in some places, but not anywhere in Spain. Roam International may be an option in that they offer local dial-up numbers around the world, but I didn't want to take the time to download their software to view the access points. They also appear to offer broadband as well. Otherwise consider one of the free dial up providers above, but if you're staying in a hotel be absolutely sure to check on the cost of a local call. Some charge up to 1,50€ per call, then add a per minute fee! Most will sign up or use an existing webmail service such as Hotmail or Yahoo!. I prefer Yahoo only because they give you 1Gig of space. But more space is great in case you cannot check your mail for a while. Yahoo also includes a briefcase that allows you to store files which you can retrieve from anywhere. Uploads are limited to 5MB per file. If you keep a calendar and task list in Outlook you can also synchronize it with your Yahoo Calendar using Intellisynch software. I don't mention Google's popular G-mail only because they didn't offer it to everyone when I was writing this. Of course now it's open to everyone and from what I hear it's a great web mail account. However, they lost me at the "invitation only" start. Free and easy solutions to check your pop email can be found on sites like Mail2web. These allow you to put in just about any email address and password and check your email from anywhere in the world. You don't need to know any of the server information in most cases. Also check with your ISP - Roadrunner, Earthlink and AOL all offer web based access to your pop-email accounts. Skype and other VoIP services. As a regular user of Skype with a good USB headset, I can vouch for the service. I have been very pleased with the quality of computer to computer calls, as well as the SkypeOut service, which allows you to call telephone numbers for just a few cents a minute. This has cut our phone bill by about 20 Euros a month! There are some practical considerations for using Skype and SkypeOut, like if you connect in a cyber cafe your conversations may not be that private. But using this with a home internet connection or outdoors while connected to an open/free wireless connection is better. Of course MSN and Google Talk are now in the game, and soon the other major players such as AOL, etc. will join. But I have had good experiences with Skype, and like giving my business to the first one who brought quality service to the masses. Most everyone is familiar with instant messaging, so I won't go into this too much. It's worth mentioning two things: 1) AOL offers a web based version of it's instant messenger so you won't need to download the program; 2) Check out Trillian if you use multiple services. Trillian allows you use their chat client and get online simultaneously with all other instant messaging services, including ICQ, MSN, Yahoo, IRC and AOL. That way any of your friends can contact you regardless of what service they use. Video conferencing is never as easy as it seems. You can use a webcam on Yahoo and Windows Messenger, although the windows application is often picky about what type of camera you are using. Netmeeting is an alternative in Windows although it is hidden in XP (to start it in XP select Start > Run > and then type in "conf" and hit enter). Both Netmeeting and Windows Messenger allow you to share applications and a whiteboard, but it requires some tweaking on both side to get the application sharing working correctly. Remote access to your home or work computer is simple if you're bringing a laptop or have access to a computer where you can install a program. PCanywhere is simple although you may need to do some firewall tweaking. For many work connections this may include installing a VPN client, (Virtual Private Network) to allow you to securely and safely access your work computer using this program. You can transfer files as well as do anything on your computer as if you were there. GoToMyPC is another software/service like PCanywhere but they charge a monthly fee. You've likely seen their banner ads which are on almost any page on the internet. If you have XP professional installed on your work or home computer you can also enable Remote Desktop and connect from anywhere. Again, some firewall tweaking or talking with your network administrator may be necessary. I use my page not only to tell people about Sevilla but also keep in touch with family. Reading my semi-daily entries keeps me from writing a lot of emails or sending pictures. There are a ton of free hosting alternatives out there, including Yahoo (through Geocities), Tripod and a list of others. And you don't need to know html to make a page - many come with some basic templates to upload photos or write messages. You can also be hip and start a blog, like everyone is doing now. Most banks now offer online banking, most for free and if your bank charges you they should be ashamed. For a short trip it may be enough to look at your balances and transfer from one account to another while you travel. If it's a longer stay and you need to pay bills make sure your bank offers a bill pay system so you can take care of it online. Most larger banks, such as Bank of America, offer bill pay. One thing to beware of when entering your information in a cyber cafe are programs which track keystrokes. Not a big threat, but a few employees of cyber cafes in Europe have been arrested for installing these key trackers. They got banking information and either managed to withdraw or transfer funds around, causing a problem for people on the road. Aside from your bank most credit cards offer online access where you can pay your bill or view transactions. If you plan to stay more than a month it can be helpful to keep your payments up to date. You can also send emails to customer service if you have questions or report lost/stolen cards, although it is best to do the latter by telephone. Here are some links to sites which may be helpful during your stay in Granada or anywhere else. You can see more links on my Links page. Currency Converter - convert any currency into another, even the now defunct peseta. Time Zone Converter - find out what time it is now anywhere in the world. Online Conversion - convert any measurement to another. The largest list online. Locate an ATM - find any Visa/Plus ATM throughout the world. The rest of the items below mostly have to do with the computer use. However, it is easy to become so involved with what's on the screen that you don't pay attention to your bag or other belongings which you have set down next to you. Always try to guard your belongings and keep them in a place where they are difficult for others to reach while you are using your computer. Be sure to always log out of any web page by using a log out feature rather than simply closing the browser. Closing the window while leaving other windows open may allow someone to log back into your account because your session has not expired. Always uncheck any boxes which offer to remember your log-in and/or password. If you have to leave your seat but are not ending your time on a public computer you should log out of any web pages and close all programs. Some internet cafes offer more private, cubicle style desks for surfing. Others are more open for anyone to view. In either case it's still possible someone can see your screen and/or keyboard to obtain personal information such as log-ins and passwords, even a credit card number. 1. Select Tools and then click Internet Options. 2. On the General tab (the default), look under the header Temporary Internet files and click Delete Cookies. 3. Under the same Temporary Internet files header click on Delete Files. 3. Under History, click Clear History. Sometimes you have to check your bank balance or make other important transactions online on a public computer. Still, if you are able to avoid online banking and or credit card transactions on a public computer you will protect yourself even more. While clearing your history, logging out and some of the other steps above will help protect you, there have been some (rare) cases of software such as keystroke capturing programs being installed in internet cafes. These essentially record every keystroke you make and save them to a file. The installer can then retrace any of your steps and obtain your credit card number, log-in information, etc. While a bit slower in terms of performance, the last year or so there are plenty of free, open source suites which are bundled to used on a USB drive. This means most of your personal, bookmarks/favorites, etc. are kept off the cyber cafes computer and stored on your USB thumb drive. Plus you can carry around documents and other things which may be helpful when traveling.